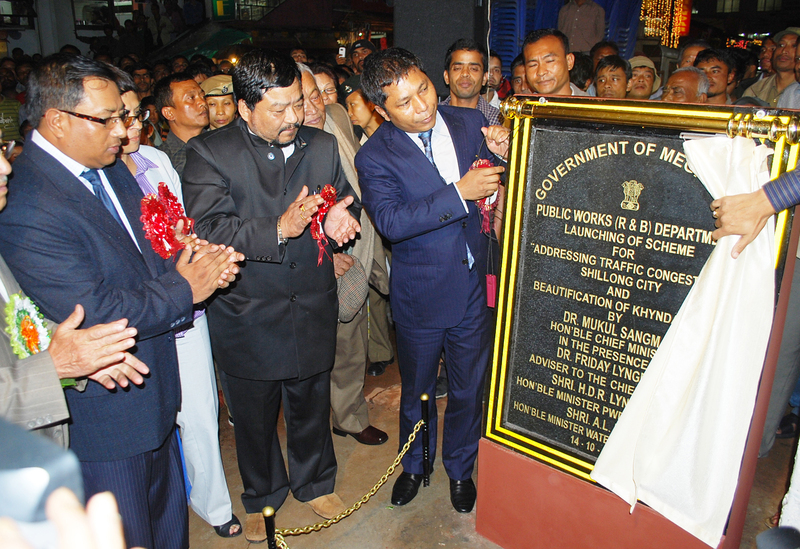 Shillong: The much-hyped Khyndailad beautification project initiated by the State Government was launched by Chief Minister Dr Mukul Sangma at a function here on Friday. “This initiative taken up by the government would remain incomplete without the co-operation and co-ordination of the people of the State,” Dr Sangma said during the function, while adding that Shillong and the State as a whole deserves better roads and infrastructure which can create new opportunities for the people of the State. Hoping to make Meghalaya a model state in the whole country, Dr Sangma said proper planning and joint efforts should be practiced to ensure that the efforts go a long way in achieving the desired goals. “There should be a convergence of efforts from various departments besides the efforts from the citizens of the State,” Dr Sangma added. Citing that the State has abundance of resources, the Chief Minister stressed on the need to exploit these resources to the optimum while adding that planning resources mainly revolves around two main resources – human resources and natural resources. Meanwhile, Dr Sangma pointed out the need to ensure equal and uniform opportunities in the State particularly the rural areas to prevent migration of rural populations to the urban areas. The projects which include beautification of Khyndailad and its adjoining areas, besides widening of roads in certain stretches of the city is being taken up at an estimated budget of Rs 16.73 crore, PWD Minister HDR Lyngdoh informed. The project was earlier scheduled to be launched in September but was delayed due to the Monsoon season. Among other dignitaries present on the occasion included Deputy Chief Minister Rowell Lyngdoh, Minister of Water Resources AL Hek, Chief Adviser to the Chief Minister Friday Lyngdoh, Urban Affairs Minister Ampareen Lyngdoh, Parliamentary Secretary FS Cajee, Chief Secretary WMS Pariat, Syiem of Hima Mylliem Latho Manik Syiem and senior officials of the PWD and other departments.